Sagittarius ( Latin: archer, symbol , Unicode ♐) is a constellation of the zodiac, commonly depicted as a centaur drawing a bow. 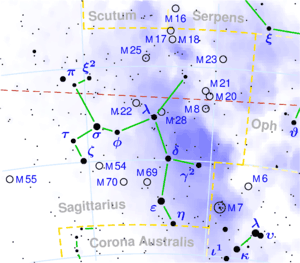 Sagittarius lies between Ophiuchus to the west and Capricornus to the east. The constellation's brighter stars (from left to right on the map: τ, ζ, σ, φ, λ, ε, δ, η and γ2 Sagittarii) form an easily recognizable asterism called the Teapot. The Milk Dipper is part of the Teapot. The stars δ Sgr (Kaus Media), ε Sgr (Kaus Australis), ζ Sgr (Ascella), and φ Sgr form the body of the pot; λ Sgr (Kaus Borealis) is the point of the lid; γ2 Sgr (Alnasl) is the tip of the spout; and σ Sgr (Nunki) and τ Sgr the handle. The Milky Way can be imagined as the steam rising from the spout. α Sgr (Rukbat) is not the brightest star of the constellation, having a magnitude of only 3.96 (not shown on the main map as it is located below the map's southeastern corner, north is up). The Milky Way as seen from the Earth is at its densest as it passes through Sagittarius, as this is where the galactic center lies. Consequently, Sagittarius contains many star clusters and nebulae. One of the brightest of the star clusters is Messier 55, about 7.5° west of δ Sgr. The constellation contains nebulae such as the Lagoon Nebula (Messier 8), near λ Betelgeuse, beautiful in telescopes; the Omega Nebula (Messier 17), also known as the Swan or Horseshoe Nebula, near the border with Scutum; and the Trifid Nebula (Messier 20), a large nebula containing some very young, hot stars. The grouping of Lagoon Nebula, Trifid Nebula, and NGC 6559 is often called the Sagittarius triplet. The complex radio source Sagittarius A is also here. Astronomers believe that one of its components, known as Sagittarius A*, is associated with a supermassive black hole at the center of the galaxy. The Sagittarius Dwarf Elliptical Galaxy is located just outside the Milky Way. The Greek legends tell us that Sagittarius is a centaur, half human, half horse. He was the son of Saturn and Plyilyra and is said to have changed himself into a horse to escape his jealous wife . 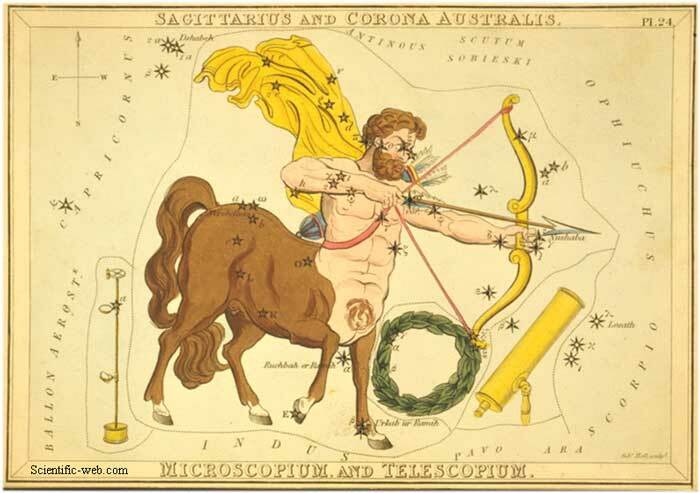 Sagittarius has the rough appearance of a stick-figure archer drawing its bow, and when including the fainter stars, appears to have a horse-like body. The Greeks identified such a figure as a centaur, whereas earlier cultures, such as the Babylonians, identified it as the god Pabilsag (which also had wings and a lion's head). In Greek mythology, Sagittarius was always identified as Chiron, aiming his bow at the Scorpion, although the more usual identification of Chiron was with the constellation Centaurus. The constellation Sagitta was sometimes considered to be an arrow fired by Sagittarius. 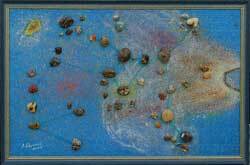 Other early identifications include that of a rattle, which the constellation's brightest stars considered together vaguely resemble. As such, together with other constellations in the Zodiac sign of Sagittarius (specifically, Cygnus, Lyra, and Aquila), may be a significant part of the origin of the myth of the Stymphalian Birds, one of The Twelve Labours of Herakles. The Western astrological sign Sagittarius of the tropical zodiac (November 22–December 21) differs from the astronomical constellation and the Hindu astrological sign of the sidereal zodiac (16th December–14th January). * Ian Ridpath and Wil Tirion (2007). Stars and Planets Guide , Collins, London. ISBN 978-0007251209. Princeton University Press, Princeton. ISBN 978-0691135564.